Initially this was supposed to be my second Saturday game this season, but Horndean v Clanfield was called off and so this would be my second game of the season, having gone to a game in Lincoln last night. I'd left it till midweek to decide my destination. I decided that if Anwar came, we would go to Bugbrooke St Michaels, a team in the United Counties League who were playing Bedford Town. If not I would go to Sandhurst Town v Farnborough, a 40 minute drive away in Berkshire. Anwar had decided to take his lad to Hillingdon Borough v Metropolitan Police as he wanted to catch me up on the Spartan South Midlands League. 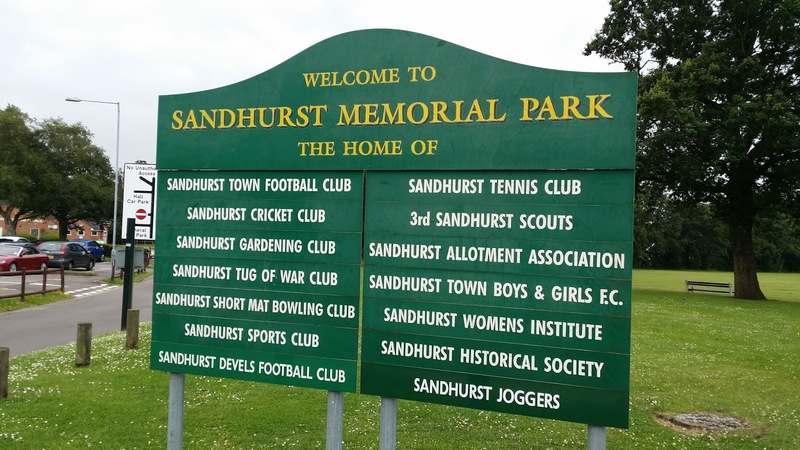 Sandhurst Town were formed in 1910 and played in local leagues up until 1990 when they joined the Combined Counties League. At the time it was only a 1 tier league, but when it expanded to 2 divisions they remained in the Premier right up until the end of the 2012/13 season, They had a record high finish of 5th 2 seasons in a row between 2003 and 2005. They will no doubt have been disappointed with last seasons 17th place in Division 1, especially being freshly relegated into that league. The club had the honour of being AFC Wimbledon's first ever competitive opponents when in August 2002, 2500 fans squeezed into the then standless ground for a match which the Wombles won 2-1. Their best ever FA Cup run came in 2004 when they reached the 2nd Qualifying Round. This was also their record Vase season too, when they got to the 3rd Round. Farnborough have lots of history and competed in the upper reaches of the Conference for a spell at the start of the 1990's. There were a number of memorable FA Cup runs too, most notably when they played West Ham United and took them to a replay before a narrow defeat. Wycombe have been regular opponents during that time my first visit was in the April of 1992. Wycombe were battling with fierce rivals Colchester United for the league title which ultimately ended in disappointment with them losing out on goal difference. Wycombe beat the high flying Hampshire side 3-1 but that was not the most notable point of the afternoon. 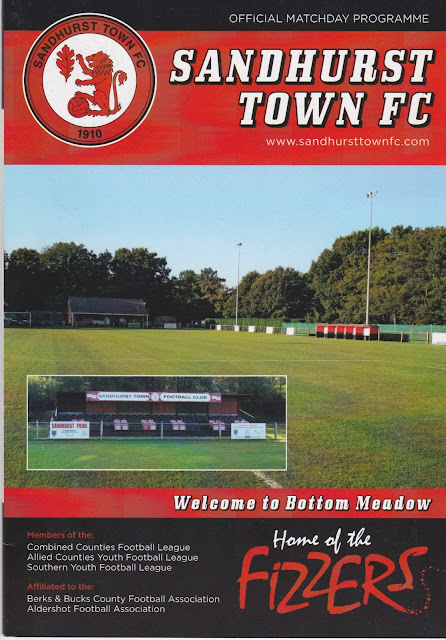 The ground looked brilliant on the programme cover, but in reality, it was a right shed. Wycombe manager Martin O'Neill even had to tell supporters to move out from under the stand as it was going to fall down! I went for another game when the club were known as Farnborough Town, that was a game against Leigh RMI in 2002 when a former Wycombe player played in goal for each side. Mark Westhead for Leigh RMI and Mark Osborn for Farnborough who won 3-0. The club reformed as Farnborough FC in 2007 after financial issues led to the old club dissolving. By now the ground was a lot neater and I visited twice for pre season friendlies against Wycombe. After going to bed at 4am on the Friday night after a few drinks and starting my blog from last night. I only had 6 hours sleep, waking at 10 and finishing off my blog before having a bath and getting some breakfast. Before I set off for Sandhurst I stopped at Morrisons as I had a £5 Voucher for fruit and veg. That was nice, getting some free cherries and grapes, but what was an utter pain in the arse was the self service checkouts. They must be the worst ever, needing to be wet nursed every 10 seconds and then the staff take ages to come. I feel sorry for them to be honest, as annoying as it is to be kept waiting 7 minutes as under staffing and shite checkouts is due to the management. After a slow journey out of Wycombe it was a good journey. I arrived in Sandhurst at 1.40 and took the mile walk into town. The pub of my choosing was fantastic - the Rose and Crown allowing me to try a new cider which was delicious. By 2.15 that was down the hatch and so I made my way back to the ground. Arriving at 2.35 it was a bit tricky finding the football ground in the massive sports complex, but 10 minutes later I was in. A fiver entry was a fair price, but no programme was a let down, but that was fully redeemed by offering free copies of last seasons ones in the bar. There was not much of a selection cider wise here, only Bulmers, so I made do with a Sausage Roll for a quid and eat that before starting my blog to kill time before kick off. Farnborough dominated the early stages but around about 20 minutes Sandhurst had a bit of a spell. It did them no good however, as Farnborough broke, went down the other end and scored through Matt Ball. 2 minutes later it was all square as Sandhurst's number 9 poked in from close range. Word in the stand was that there were a few Brazilians in the Farnborough team. On 38 minutes, Farnborough's number 10 did the Brazilian bit with a mazy dribble around the keeper but his finish was distinctly Andorran, missing an open goal. Sandhurst punished this, taking the lead on 40 minutes when their number 3 fired into the roof of the net. Farnborough looked to get back into it and forced a good save out of the Sandhurst keeper but the hosts remained ahead at the break. To my shock, Anwar turned up at half time. His game had been moved to another pitch and he had decided to come to this time along with a couple of Wycombe fans - Chris and CJ. It was a welcome surprise and I agreed to give him and his son Hicham a lift back to Wycombe station. Farnborough equalised 10 minutes into the second half when a horrible mistake from the Sandhurst keeper gifted them a goal as the ball went straight through him. He redeemed himself around 15 minutes later as a great save prevented Farnborough taking the lead.the visitors got the winner on 90 minutes with a comical own goal. The keeper rolled the ball out to the number 2 who in turn whacked it back over the keepers head, leaving him standed. They added a 4th in injury time with a great shot from outside the area to cap off a decent comeback. BOTTOM MEADOW is a fairly basic ground but is in pleasant park land surroundings. There is just the one stand, holding around 100, though there is further cover at the clubhouse end. The clubhouse itself is nicely decorated but only offers a basic range of drinks. Town is a around a mile away and is well worth a visit for the Rose and Crown pub.